Lately I've been super into neutrals, particularly lighter ones. There's something about the craziness of the holidays that makes me want a minimalist palate-cleanser. There's also something that feels slightly rebellious about wearing winter white in winter—yes, in spite of its name—but thankfully I live somewhere where the worst weather we get in winter is rain, not snow, so I don't need to worry too much about getting my whites all splattered with sludge. Ok, you might be thinking, "But you're not wearing all white." Which, technically, is true. 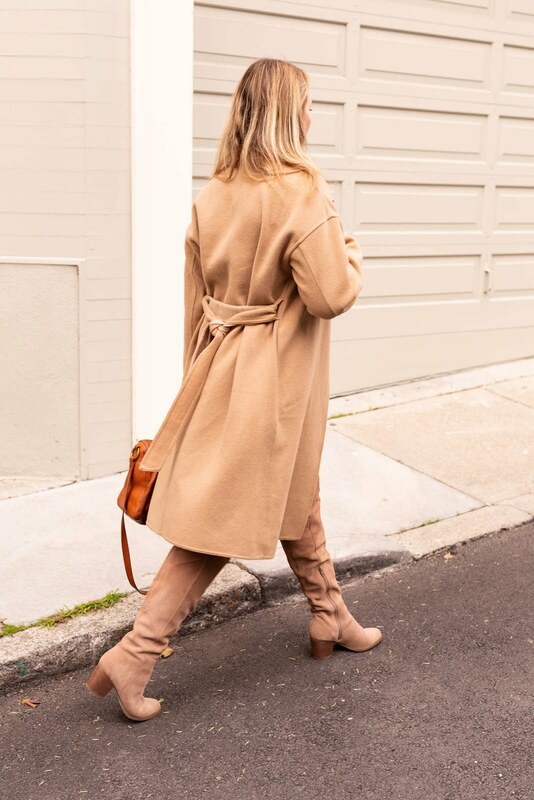 But it's also the key of wearing all white in winter—you need to mix it up with a little camel and/or beige. That's pretty much a spoiler alert for this whole post, but if you want the details of how it all came together, read on. This look started with the sweater I'm wearing. While I was in NYC last month, I was in the market for a light-colored sweater dress. I saw this one in the window of Pinkyotto, tried it on, and bought it in a matter of minutes. (Depending on how you look at it, I either have a gift or a big problem.) It's not technically a dress, though, it's a tunic, which is close enough for me and probably more practical anyway because I can wear it with pants too. Pinkyotto's website is, charmingly, not shoppable, but I've linked a few very similar styles below. As I mentioned, I had wanted a dress but ended up with a tunic, so I kind of faked it into a dress by wearing a similar-colored skirt underneath, which you last saw in my post about the ballet. While a white tweed skirt may seem impractical, I get a ton of wear out of this one. The color is a little unexpected, especially this time of year, and if you're worried about spilling on it, don't. (Worry, that is. Or spill, if you can help it.) I believe there's one size of this left in the link below, but I'll include a similar style too (I'm in a 40, which is like a US size 6). Of the two winter coats I bought late last year, this camel coat is the lighter one; usually if I go heavier with my sweater, this is the coat I reach for. (It's the same logic I used in my previous all-white post.) I also didn't want to create too much contrast—it's just different enough from the white. This coat is from Uniqlo and sadly sold out—as are many coats at this time of year—but I've linked two similar styles below. I have yet to jump on the white-shoes bandwagon (I wear a size 8.5 and fear my feet will look ginormous), plus bright white would have looked somewhat weird with the warmer tones of the ivory and camel, so I thought my beige over-the-knee boots (also last seen in my ballet post) were a good solution here. Plus, they keep my legs warm and I don't have to shave! I was kind of late to the whole over-the-knee party, but between these and a pair I just bought (coming to the blog soon), I'm a convert. These are true-to-size and super comfy! You've also seen this bag before—in this leopard-themed post, most recently—and to be honest, it's my everyday bag and I just grabbed it because we were running kind of late to shoot this post. Which brings me to a good point, which is that, as you may have noticed, most of what I'm wearing in this post, I've worn here before. A lot of my fellow bloggers have been talking about shopping less and shopping their own closets more, which is something I need to do more of this year as well. I hope that's cool with you, dear readers, but my point is not to bore you—it's to help you see different ways of wearing things in your closet. It may sound trite coming from a fashion blogger, but I think we could all benefit from shopping just a little less. In my mind, at least, that means more money for vacations! Using the white/tan neutrals are really a great way to bring in those lighter shades. I love the boots! If I didn't have a super messy toddler I would be wearing whites too! This is such a gorgeous look! That's a great outfit. I love wearing monochromatic shades of white too and I think it looks especially great paired with camel. loving those boots! super cool look! Great neutral color outfit. You did a great job on making it interesting! So cool! Love those boots and the whole warm neutral pallete! Gorgeous on you. I have a dress that is shorter and I am tryng a slp extender. I love that the skirt paired so nicely with the beautiful tunic.